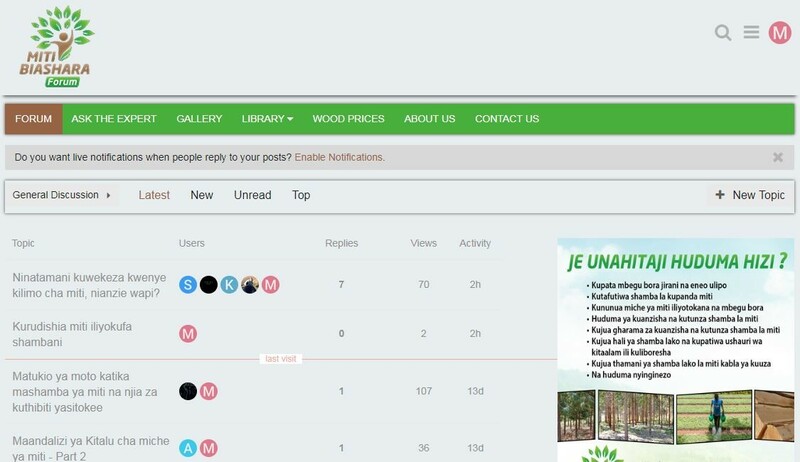 As one of the efforts to ensure actors in the forestry sector have access to information, services and inputs, Forestry Development Trust facilitated development of an online platform which has been taken over by African Forestry (partner) and was launched on 6th August, 2018 in Dar es Salaam. The launching event featured in most of the Tanzania leading newspapers (Daily News and The Citizen), television stations (TBC, ITV and Clouds), Radio stations (Radio Maria and TBC One) and Blogs (Michuzi and Mwanahabari). 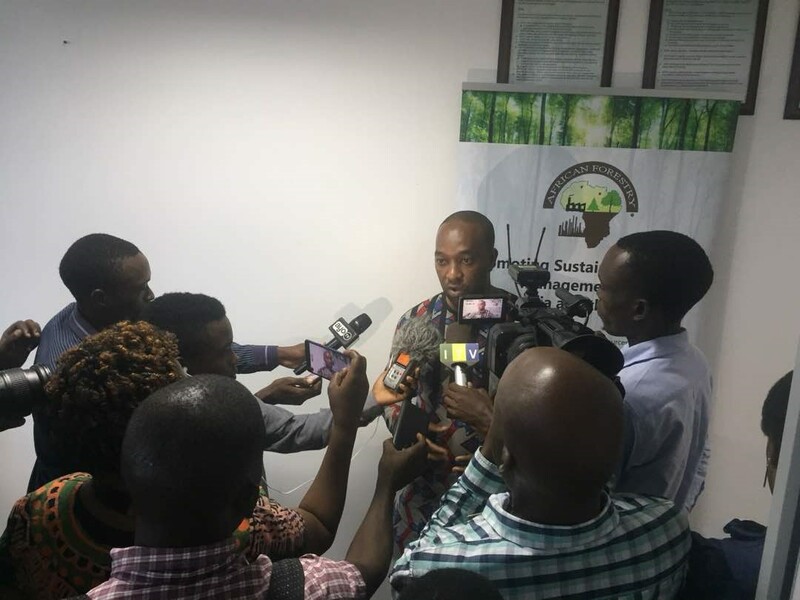 The objective of introducing the platform is to easy the process of searching information (service providers, input supply, advisory services and experience sharing) for commercial forestry actors in Tanzania. The Tanzania Forestry Research Institute (TAFORI) marked a milestone for the forestry sector in organising the first TAFORI scientific conference on forestry research during 24-25 April 2018. The conference theme was sustainable industrial economy, with FDT contributing a paper ‘Commercial forestry development in Tanzania: progress with investments, innovations and institutions supporting tree improvement, input supply and advisory services’, which brought together some findings and sector developments from the four components of the Trust’s work. The accompanying presentation can be found here. Firstly, the private sector (formal and informal) plays a fundamental and growing role in commercial forestry (including tree growers, investors, SMEs and service providers). This requires an enabling policy environment that recognises private roles, addresses key constraints, and stimulates investment and innovation. Secondly, the power of collaboration by public and private actors in technical innovations such as tree improvement research is immense, as it allows for leverage and sharing of technical and financial resources. Ensuring coordinated and sustainably-funded tree breeding is a key sector challenge. Thirdly, the sustainability of commercial forestry development and national tree planting initiatives depends on explicit recognition of economic and technical considerations including grower incentives, financial viability, site-species selection and the quality of inputs and practices. An assessment of Tanzania’s wood product markets commissioned by FDT has been completed by UNIQUE forestry and land use GmbH, an international forestry consultancy firm. The comprehensive report assesses the current and future projections in wood supply and demand, and the state of individual wood markets and value chains. It highlights the scale of the opportunity in Tanzania, which is significant, before proposing a set of recommendations that market actors can pursue to support sector transformation. 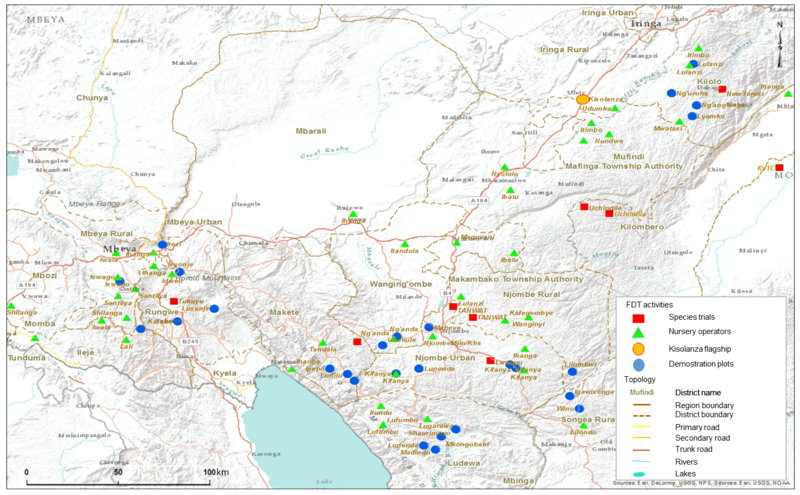 Commercial forestry sector is in a period of transition as supply base moves away from the large private and government plantations towards small and medium scale tree growers, who now account for around 54% of the national plantation area of 325,000 Ha (also see plantation mapping in Southern Highlands). Demand will double between 2013 and 2035 driven largely by construction, furniture and paper sectors. 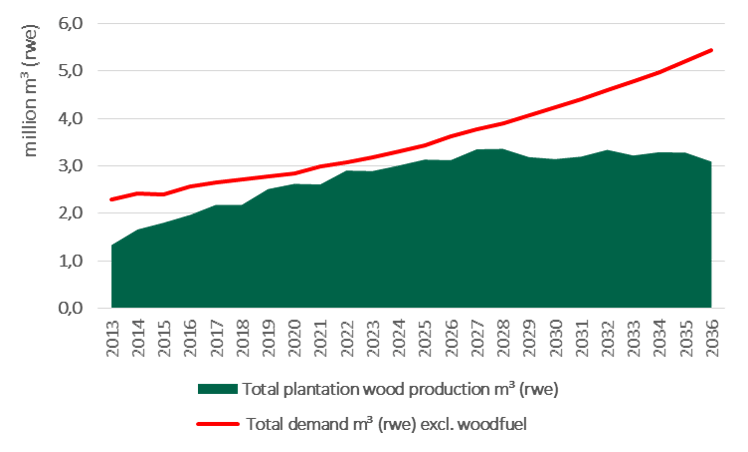 The supply deficit increases greatly after 2025, reaching 3 million m³ (rwe) deficit in 2035, mostly due to large diameter sawlogs for sawn timber and veneer production (1.4 million m³) and wood fibre for pulp and particle/fibre board (1 million m³). The processing landscape is not set up to efficiently serve small growers, and there remains a challenge of poor quality products reaching the market and risk of substitution and imports. From a market perspective, catalysing investment in better processing technology can be boosted by support to investor feasibility/business planning, aggregation structures, supply-demand information systems, technical processing skills development, log grading and adaptive forest management. From a policy perspective, a number of enabling sector conditions can be developed to promote an aligned vision, communication among value chain actors, application of standards and applied use of information and data to drive policy support. The Forestry and Beekeeping Division of the Ministry of Natural Resources and Tourism is in the process of revising the 1998 Forest Policy, including consultations with stakeholders around the country. Commercial forestry is a major economic activity and significant contributor to government revenue and employment, and a supplier of raw material and wood products for numerous industries. However, the potential for the sector to contribute more is immense and worth additional public policy investments. This synthesis report on improving commercial forestry in Tanzania is based on perspectives and information provided by private commercial forestry actors from the Southern Highlands. It was produced as result of a series of consultative meetings held during July and August 2017 and attended by representatives of SMEs, Associations such as UWAMBA, SAFIA, NOFIA and SHIVIMITA, Wooden pole enterprises, Plantations and wood processing, Tree Growers Associations, Medium scale tree growers, Tree grower service providers and Timber traders and transporters including raw pole suppliers. The meetings were facilitated by the Forestry Development Trust. In addition to highlighting the need for greater recognition of commercial forestry and private actors, the paper endorsed by the industry actors included issues specific to forest plantation development (land availability, acquisition and tax; fire, pests and disease; tree improvement and planting material; information, extension and outreach), forest industry development issues (raw material supply; industrial output and efficiency; wood trade and markets; and improving business environment); and industry-wide enabling conditions (private sector coordination and dialogue; financial mechanisms and incentives; rural infrastructure; forestry research, training and education). Quality concerns are undermining the competitiveness of the wooden utility pole industry, a key part of the commercial forestry sector and major contributor to the economy. The pole value chain includes multiple channels by which treated and untreated poles move, with a diversity of perspectives concerning quality. TANESCO has recently taken a strong lead in convening industry players to revisit issues of quality, with FDT acting as a source of technical expertise. This has included the preparation of an issues paper which was presented at a TANESCO-organised workshop held in Iringa, 28-30 June 2017, and attended by over 100 participants from five countries. The issues paper focuses on the pre-treatment phase of the value chain. Significant growth in plantations is observed across the Southern Highlands, dominated by small-medium scale private tree growers. Industry players have embarked on an advanced tree improvement and seed production programme, which bodes well for the future pole industry if adequately supported. Given Tanzania’s optimal growing conditions, opportunities also exist to significantly enhance plantation quality and productivity. As is the case with other sectors, there is a need and opportunity for buyers such as TANESCO to become more engaged further down the supply chain to drive market requirements. The Trust has continued to stay engaged in providing technical inputs to following up on the workshop resolutions concerning treatment, specifications and quality management. The output of a previous workshop organised by FDT in 2015 can be found here. This report presents the first round of survival and growth measurements after 15 months for 4 species and clonal trial sites established in 2014/2015 established with partners. They are located at Tanwat (Njombe), Lwangu (Njombe-Kifanya highway), Uchindile (Green Resources Limited) and Kisolanza Farm (Mafinga-Iringa highway), thus falling broadly under warm temperate and sub-tropical zones. Each site has 3 blocks of trials namely Eucalyptus clonal hybrid, Eucalyptus pure species and pine species trials. All trials achieved over 80% stocking levels which is above the bench mark set in the standard operation procedures (SOP). Early results also indicate the differences in mean height and stem form among species and clones. In early 2018, the Trust will produce an updated performance report that covers ten trial locations established in 2014/2015 and 2015/2016. FDT is working with several members of the Tree Improvement Research Working Group to trial new species and hybrids of Eucalyptus, Pine, Corymbia and Casuarina across different sites in Tanzania. This will allow us to see which potential trees perform best in the various agro-climatic conditions, while giving growers a clearer idea of their potential returns should they invest in different species or hybrids. Click here to download a table showing what is being trialled where. During the 2016-2017 planting season, additional species and clonal hybrid trials were established, including a broader selection of genetic material and covering lower altitude, drier sites. Collectively the trials now represent >110 types species and clonal hybrids (with many sourced from multiple locations) on 14 sites ranging in altitude from 200-2400 m, making them an advanced portfolio in East Africa in terms of species diversity and ecological representation. This report presents the first round of survival and growth measurements after 15 months for 4 species and clonal trial sites established in 2014/2015 established with partners. They are located at Tanwat (Njombe), Lwangu (Njombe-Kifanya highway), Uchindile (Green Resources Limited) and Kisolanza Farm (Mafinga-Iringa highway), thus falling broadly under warm temperate and sub-tropical zones. 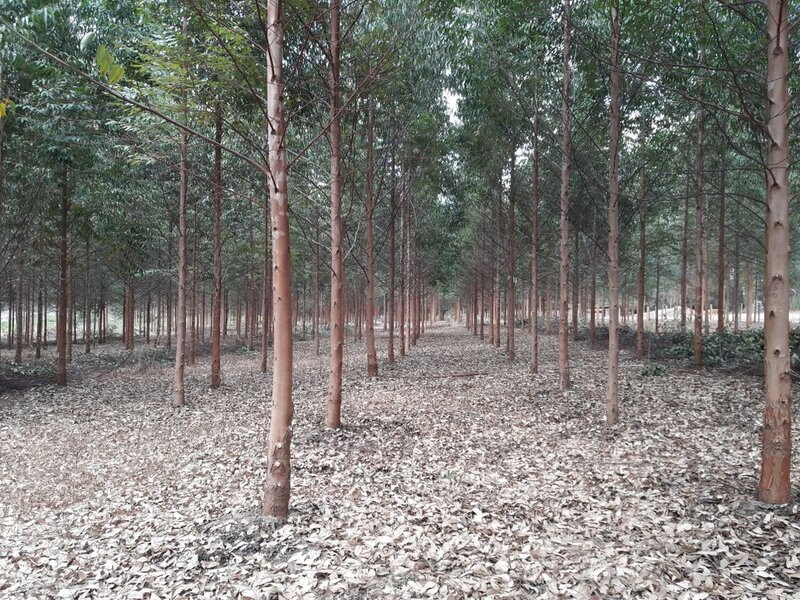 Each site has 3 blocks of trials namely Eucalyptus clonal hybrid, Eucalyptus pure species and pine species trials. This report presents the first round of survival and growth measurements after 15 months for 4 species and clonal trial sites established in 2014/2015 established with partners. Breeding populations of the two flagship species, Pinus patula and Eucalyptus grandis, were also established with Tanzania Forestry Services Agency during 2016-2017. FDT plans to establish seedling seed orchards during 2017-2018. These new Forest Plantation and Woodlot Technical Guidelines, published by the Forestry and Beekeeping Division of the Ministry of Natural Resources and Tourism, present best practices for three main commercial plantation tree species grown in Tanzania – Pine, Eucalyptus and Teak. The guidelines cover topics including species and site selection, nursery management, plantation and woodlot establishment, maintenance, pruning, thinning and forest health. The intended audience includes large and small tree planters, extension agents and whoever is engaged in preparing extension and training materials on commercial forestry. The guidelines were prepared with the support of the Forestry Development Trust, lead by Prof. Shabani Chamshama from Sokoine University of Agriculture, and received contributions on latest developments from private forest companies and public institutions including New Forest Company, Kilombero Valley Teak Company, TANWAT, Green Resources Limited, Tanzania Forest Research Institute, Tanzania Tree Seed Agency, Tanzania Forest Services Agency, Forestry and Beekeeping Division and the Private Forestry Programme. Kisolanza plantation demonstration site was established in 2014 by the Forestry Development Trust in collaboration with Kisolanza Farm. This dynamic training resource is an important landmark in the southern highlands to showcase productivity gains from good planting materials, plantation establishment and management. It is also part of an extensive network of tree improvement sites. The strategic location on the Mbeya-Iringa highway enables a range of forestry stakeholders to easily access the various learning areas on offer, including tree growers of all scales, traders, policy makers, educators, prospective investors and opinion leaders. The site is also used for organised training and networking events. Kisolanza plantation demonstration site has five learning areas: plantation management, plantation maintenance, coppice management, clonal hybrids and species trials. This leaflet provides an overview of their purpose and early results, while this presentation provides a useful training resource. For the first time, FDT has produced a map of woodlots and plantations in the Southern Highlands that distinguishes the two dominant species, pine and eucalyptus. This information is critical in understanding the true extent of tree planting, particularly useful both for investors and wood processors who are interested to secure raw material supply and link to smallholders. While the extent of public plantations and industrial-scale public and private plantations has been well documented, the area covered by smaller scale private forestry in the Southern Highlands has been subject to great uncertainty for many years. 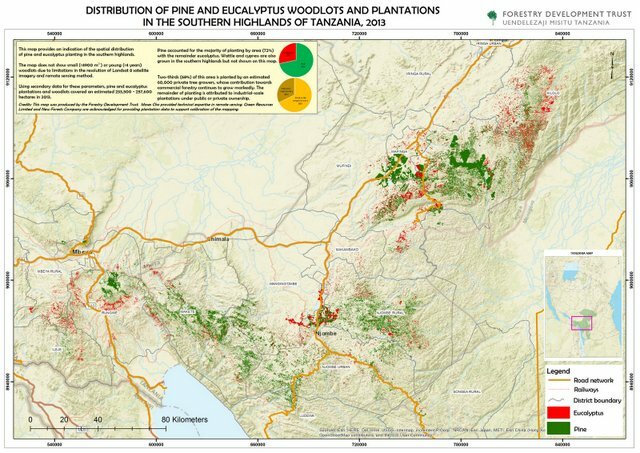 These recent developments are an important step towards estimating the planted area and potential wood supply volumes across the landscape. The information will be used as part of a wider market study being undertaken by FDT that is calculating updated supply-demand scenarios for different wood value chains. A range of high quality training and extension materials have been produced by FDT, covering key steps from site and market considerations when selecting species all the way through to final plantation management. The two formats – leaflets and videos – target private tree growers, with consistent delivery of core messages possible as the content is based on national technical guidelines developed by public and private stakeholders (and currently being finalised for publication by the Forestry and Beekeeping Division). The Tree Improvement Research Working Group, consisting of major public and private sector forestry actors, have finalised a Tree Improvement Strategy for the Southern Highlands. The strategy covers introduction, breeding, commercial production and conservation, marking a milestone in collaborative efforts to help ensure the availability and application of high quality and diverse genetic material to maintain competitiveness and resilience of the commercial forestry sector. Drawing on experience from other countries worldwide, a critical part of success in tree improvement is to ensure a collaborative approach for the benefit of all sector players, including the sharing and pooling of expertise, resources and information. The Tree Improvement Research Working Group was established in April 2015 with completion of the strategy as one of its first tasks. Click here to download this report, which sets out the findings from FDT’s two major farmer surveys conducted to date. These surveys collected key data on tree-growers’ scale of planting, access to information, membership of associations, non-tree crops and greatest constraints.